In the old days, film shows turned over to sound via videotape and OMF. That meant sound got a 29.97 version of a show that was cut at 24, complete with the 3/2 telecine-style cadence inserted. It was an awkward and slow hand-over for both picture and sound. Today, though most shows no longer deliver tapes to sound, many still create 29.97 Quicktimes, often for no better reason than, “it’s what we’ve always done.” But if you’re working on a 24-fps show, the easiest and simplest way to turn over is with 24-fps Quicktime. Why are 29.97 QTs problematic? First, because creating a 29.97 QT from a 24 or 23.976 fps project doesn’t just mean introducing 3/2 — it means duplicating frames. That makes it awfully hard to cut sound effects precisely. Second, 29.97 QTs take a long time to make, wasting hours that picture assistants don’t have. But if we turn over 24-fps Quicktimes, what settings should be used? And how should sound handle it in Pro Tools? I’ve spent several days hashing this out with a music editor friend. I made a simple sync test: a head and tail leader with sync pops, separated by three minutes of filler and overlaid with an Avid Timecode Burn-In effect. 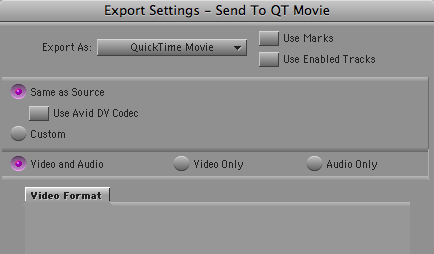 From this I exported Quicktimes and OMFs, which my friend imported into PT. Then he added his own counters, compared them with mine and checked the pops. A pulldown sync error is about 1.5 frames per minute, so at the end of 3 minutes, if we’d screwed up, he’d be out by over four frames. Choose any codec that you and your sound editors prefer. But consider using the Avid codec. That’ll produce the fastest QT conversion, and your sound editors will see exactly what you saw in the Media Composer. You won’t need to fool around with Quicktime export settings, either. Just select “Same as Source” in the Quicktime Export dialog and you’re all set. In Pro Tools, your sound or music editors will work as follows: If you are working in a 24p project, they’ll run picture and timecode at 24-fps. If you’re working in a 23.976p project they’ll run picture and TC at 23.976. Either way, they’ll play back audio at 48K (or 44.1 in the unlikely event that you’ve been working that way in MC). That’s all there is to it. If you take the time to create a test like I did (always a good idea), your sound editors will see the tail pop from your OMF line up with the tail sync mark in your QT, and their TC counter will line up with yours. They’ll see exactly the same frames you did in the Media Composer, and your exports will be quick and relatively foolproof. This entry was posted on March 21, 2009 at 12:44 pm and is filed under Audio, Avid Technical Tips, Workflow. You can subscribe via RSS 2.0 feed to this post's comments. You can skip to the end and leave a response. Pinging is currently not allowed. 1. CPU overhead playing an Avid-codec Quicktime is usually too high for complex Pro Tools sessions to playback smoothly. Especially DNxHD (but also “Meridian” SD codecs). Given this, I recommend more ProTools-happy QT codecs. For standard definition, historically many sound editors have preferred Motion JPEG A at 720X486 or DV at 720X480. For both SD and HD, I suggest using Photo-JPEG at “Medium” (=50% on the horizontal slider) quality. I agree keep the original frame rate, resolution and pixel aspect as your project. But color space should be switched to RGB from 601/709 for Quicktimes that are to be displayed on a computer monitor. Great to hear from you here. Thanks for clarifying all that. Good points, all. Spot on and very helpful. How long does this export take on the AVID? Longer than real time? It depends. Since mid-2003, Avid Quicktime export speed is almost entirely dependent on CPU speed. (before this, especially on Meridian-hardware Avids, it is MUCH MUCH slower, relying on the PCI cards for Avid codec decoding/re-encoding). Today, a fast modern multiprocessor Mac or PC running a relatively recent version of Avid Media Composer software I find exports either standard def or high def projects to almost any codec (that’s right, Avid quicktime exports seem to basically be codec agnostic speedwise when there are renders required) a bit faster than realtime– say 15min for a 20min reel. Note this presumes an average amount of security overlays, window burns, dissolves, and basic visual graphics, titles, etc. For comparison, the same 20min sequence takes 3.5 hours to export on Meridian-hardware Avids! For this reason alone, many old Meridian-Avid workgroups (on Unity) install a single affordable software-only Media Composer station just for creating exports! Good point. Another reason for people to upgrade their aging Meridien systems, and one that influences the bottom line in terms of assistant overtime. Amen to making the codecs easier to find. Excellent post – but I have a question. Working mainly with HD / RED media, most of my workflow is 23.97 or 24fps based. As a result, the sound is synced to the 29.97 picture, and then married to the original 23.87 format. This is not a problem, since most of my projects are short, but I suspect it would cause a problem the longer the project is. Any thoughts / suggestions or workarounds on this? In theory, there’s nothing about this setup that’s going to cause sync to drift. 23.976 and 29.97 are both a tenth of a percent less than their “nominal” rates and can be used together. If you’re concerned, do a test. Make a sequence with head and tail leaders (sync marks carefully and precisely lined up with audio pops) and separated by about 3 minutes of filler, and run it through the whole workflow. See if you’re in sync, heads and tails, when you’re done. It makes sense that the 23.976 and 29.97 would work – what about 24fps source footage? Would there be any drift there? I’m delighted that this discussion is happening, as I find there is a lot of confusion, especially on 24p HD projects working offline in SD. I too have found that some sound facilities can’t accommodate 23.98 DV Quicktime files. It depends on the converter – many Canopus boxes will insert the 3:2 cadence on the fly, but some are using other converters and even old DV decks for their conversion, so it’s never safe to assume. The lack of precise frame correspondence concerns me, so I advise all my students to be prepared to generate both – a straight-over 23.98 file and a 3:2 29.98 version, just for that oddball foley room or ADR booth that might need it. That way the post audio crew can always check against the true 23.98 before printing stems. It’s a hassle, but I call it insurance. Good points. 23.98 should be the “right” answer, especially for hard effects and ADR, but it ain’t always so.